Welcome to our Costa Rica Travel Tips. Here is where to find tips and advice for traveling to Costa Rica and making the most of your time there. What are you searching to do here? Scuba diving? Whale watching? Zip Lining? Find out what to see and do here as well as what to be careful of. Or perhaps your dream is to retire in Costa Rica. Costa Rica Travel Tips can help with that too. Wondering what to do in Costa Rica? Is it the wonder of gazing at the humpback whales? Not many people have the opportunity to experience this. There is unmatched scuba diving and snorkeling here as well. Perhaps the regular eruptions from La Fortuna that are guaranteed to make your jaw drop is what you are searching for. Costa Rica offers all of these experiences. Unless you have loads of time, you may have to return. Zip lining has become one of the most popular activities, not just in Costa Rica, but in various other Central American countries. It is an adrenaline-pumping adventure. It is also a way to get a view of otherwise extremely remote areas. 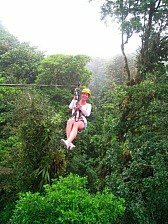 Arenal is one of the top places for zip lining in Costa Rica. 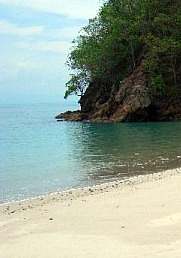 Other popular areas include Manuel Antonio, Quepos and Monteverde. Be sure to check our Trip Planner for crucial information you should know before boarding that plane or ship. You will discover essential Costa Rica travel tips here. Simplify your trip to Costa Rica with all the information you need in one place. Locate Airlines for domestic travel within the country--as well as international travel to and from this coastal beauty. Affordable Travel is not synonymous with inferior conditions. It's about getting more for your money. Use simple strategies for traveling affordably like staying at hostels or bed and breakfast inns. They are cheaper and very common in Europe and South America. And use public transportation whenever possible. This government agency provides a List of Emergency Services for United States citizens abroad. Resources include arrest, victim of crime, sending money, stolen passport and more. Hoping to Retire in Costa Rica? Many expats have taken the plunge and are experiencing a quality of life unmatched in most retirement havens. This Central-American country boasts fantastic year-round weather, low cost living, and affordable health care. Is your dream to retire overseas and wake up to warm tropical breezes in the morning? Or is your vision of retirement bliss gazing at the snow-capped mountains of the Andes?